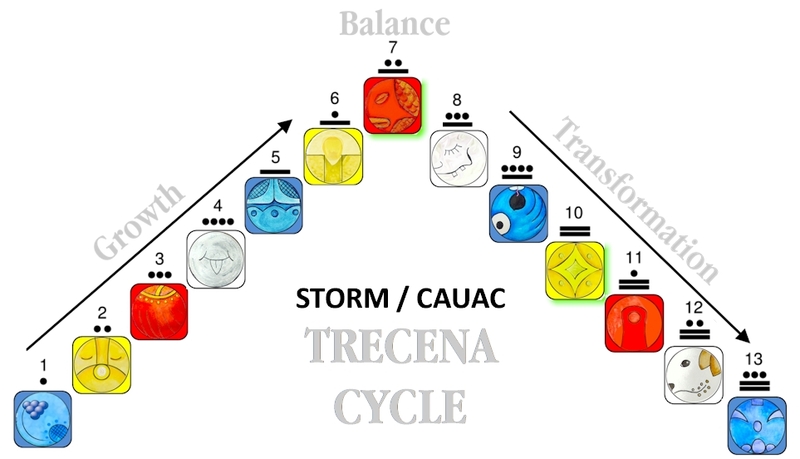 The CAUAC trecena is guiding us to Receive a New Life of Spirit. Like a charge of Lightning Force, the Storms of Life remind us what is really important. When we face the potential for everything to be swept away, we have a new perspective of everything we Love and are Grateful for. Shelter, a warm bed, and something to eat in a place where we hold the Authority, are the fundamentals of “Living the Dream.” Without knowing some hard times, I wonder if it could mean so much to me. These are the fundamentals that the Whole Deserves. In a world of Peace, it wouldn’t be so hard to cover those needs for each other. When “Home and Family” live in Harmony and needs are met, there will be nothing but Peace when we step out the door. Wind/IK is the Breath of Life and the Breath of Spirit. The Element of Air supports our first breath to the last. Wind is the Whirling of Life and the medium through when the Whole is connected with each breath. Wind/IK carries the Sound of Life and speaks to us as the Sound of the Creator’s Voice. Wind expresses Intention as a caress, a gust that moves us quickly, and a gale that clears dead branches so the strongest parts of us will thrive. The Elders said to listen for the Wind and to stop when a breeze touches your cheek or when the rustling of the leaves catches your attention. Remember what you were thinking and see if you hear the Answer in the way the Wind expresses itself. The Whirlwind is the double helix of smoke that carries our prayers to the Great Spirit. Like the Body and Soul, together rise in a Spiral from the Darkness to Light. Whirlwind represents the 13th Dancer – the Ascended One that leads the Dance of the 12 Below. Like the 12 disciples or 12 constellations, the 12 below is the Whole of a Divine Family. Wind is the 13, the Consciousness of a Divine Creator. Wind can lead us or give us a big push. CAUAC is delivering a Renewal of Light. Our Brightest Guiding Light was our Choice to Believe in a Divine Creator of Unconditional Love. In a new climb of Spiritual Growth we’re pushed to new limits of what we could Believe. Wind/IK can Breath the Life for a Second Wind. The Love of a Divine Creator is beyond Human Understanding. It’s hard to imagine a Love that Goes on Forever, and that there’s no way we could ever lose it. This is a gift. We learn how just a little bit of it is all we need to be Happy. There would always be something more to learn, more Love to See and Acknowledge. Our Life was never meant to have an ending to Love. Each day we’re given is the next Sacred Opportunity. To all my relations, may we Remember the Creator spoke The Creation with the Breath of Unconditional Love, and dreamed we would Know everything we need to Know to Create it. May we give thanks that this is what we are watching unfold before our own eyes. May we Remember the Authority of the Love that Breathed us to Life, and that we were created to fulfill a Divine Reason from the Beginning to the End. May that be all we need to Believe. May we stand on the Truth that an Almighty Creator intends a Divine Destiny of Peace and Harmony. May we LOVE the Earth, the Sunlight, the smell of the Air. May we listen for the Sound of the Mother and call Sacred the breath all living things draw together. With every breath we draw, may we Know we are living for a Divine Purpose.